Split shifts make for long days, with a morning shift starting long before sun-up and finishing around sundown. Too many days of this and you'll forget what your home looks like in daylight. This split put me on the 441 Breeze early, followed by a late afternoon trip on the 109 returning downtown Miami workers to their homes in west Broward. Meanwhile, Hurricane Matthew was churning up to a Category 5 storm down by Venezuela. 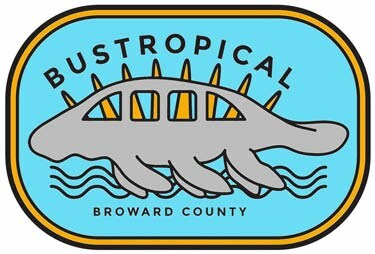 He was puckering up to give Broward a gentle kiss next week, with enough forceful passion to curtail weekday bus service to a Sunday schedule for a couple days. Since the Breeze doesn't run on Sundays this was to be my last run on the Breeze for awhile. To extend this final voyage, I was issued a New Flyer time machine bus a decade old and one of the first artics in the fleet. It was a slow old beast with no middle doors, forcing passengers to make a long walk to the front or back. This wasn't the first Breeze of the day, or the 2nd or 3rd, but sure felt like it with a 6:30 am departure at the tail end of the night's blackness. My day was only beginning, but the casino worker waiting at the first stop had wrapped up her night shift and was upset. She had just missed the Route 19 bus that blew by, and didn't want to wait 20 minutes for the next one so she hopped on our bus. 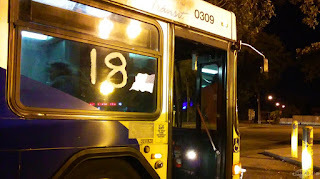 The Breeze is limited-stop and doesn't service her local stop, but the adrenaline was running and she was hopeful we could catch up to the 19 in time for her to transfer. 'Is the casino busy in the middle of the night?' Not being a gambling man, I wondered if it paid to keep the lights on 24 hours behind the hanging gardens in that Babylonian palace of chance. "Night is the busy time." She said flatly, still focused on catching her intended bus. I got the impression she left work behind once she walked out the door. "Hooo hoo. Alright, bus driver!" We didn't catch her bus. At Kimberly Blvd a waifish young man boarded, dour while sliding his Family Pass through the box slot. 'The Golden Ticket!' That's what I call these annual passes, issued to Transit employees and shared with family members. "My Platinum Card." The blank look was replaced with a simple grin. "It's a good thing my sister's bangin' the bus driver!" "A year with no bus fare? WHAT?!" He bragged with flamboyance before sliding into the cabin. A man snickered nearby. South of Stirling Road the confounding street-widening project continued to constrict traffic into a brutal snarl. Lanes were reduced and realigned as we skirted the edges of excavation pits that could swallow a bus. We'd done a round trip and were on our next to last trip of the shift when an older man squeezed on to the bus. He was not large, but he carried a cumbersome sofa cushion. The assumption was he wanted a soft seat on the bus, but instead he set it on the luggage shelf and stood up front to look out the window. When we got to Taft Street, the intersection allowed a partial view of Hollywood Memorial Gardens with its green expanse of graves pushing up to used car lots. "I'm getting a settlement soon for my leg injury." The man piped up, inspired by the cemetery where loved ones lay at rest. Suddenly the cushion made sense. "I'm going to buy a $1 million insurance policy to leave to my son and two grandsons. $2 million if I die in an accident. Then I'm moving to Vegas in 5 years for the dry weather." I had to praise him for looking out for his family that way, while also acknowledging the bitter truth that we are often worth more dead than alive. Life is the most powerful force in the universe, even ahead of Love, yet at the same time as flimsy as a breath. Later in the afternoon on my second shift I crawled the express bus up the crawling Turnpike northbound. At one point, the southbound lanes on the opposite side went completely empty, but the cause wasn't immediately visible. Safe money would go with yet another critical car crash. Then, flowing over an overpass like an army of ants came one motorcycle after another. 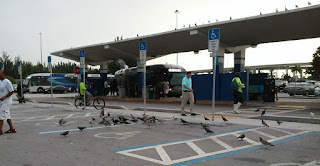 They were countless as they created a solid screen around several black SUVs, low floor white vans, and two ambulances. Another bus driver called over the radio to find out why he couldn't go south since the highway was closed to traffic at the height of rush hour. "Candidate Clinton is in town," was the brief reply, with the understanding that he would have to wait it out. Gawkers and sheer volume of cars delayed our own progress and extended my already long day. Storms will threaten and storms will make landfall, politicians will visit and leave, and the final rest will come soon enough. In the meantime here we are, moving through it all no matter how hard it gets. Saturday blended into Sunday for me, as I was issued with the same bus from the day before - though it was a different route. Instead of an interminable trip up and down University Drive, today would be a series of short skips back and forth across Atlantic Boulevard. The engine retarder light still blinked at me from the dash. A different light had gone out this bright morning: José Fernández, ace pitcher for the Miami Marlins, had died in a boating accident off Miami Beach at age 24. Unsavory details would emerge later to tarnish the shine, but we still mourn our local hero. Several determined crossings of the Florida Straits followed by deportation, and heroically saving his drowning mother in the process, added to the legend behind the perpetual easy-going Cuban smile. Life goes in cruel circles sometimes, like Jaco's brutal coda on Wilton Drive, mere blocks from his childhood home. The same waters that brought José to his new life were also the setting for its end. Starting out the shift, a regular from the University Drive route was waiting for me. A quirky older woman, always nervous about getting stranded somewhere. She'd dyed her oily lank hair and the gray roots were working their way back into view. She was short on the fare which made her more nervous, so I reassured her it wouldn't be a problem. At State Road 7, the regular with his Mickey Mouse floppy hat boarded. "This is my last Sunday. I got fired from my sign job. It's illegal now." He was on shaky ground at this shock, and unsure of his next step. 'You're a sign waver? That's not illegal.' I was sure the First Amendment protected this. "They just passed an ordinance..."
'In Margate? Maybe try another city, like Pompano?' I suggested, looking for another option. "I'm looking at Pembroke Pines." A drastic move to a south county city. The somber news made for a quiet trip eastward. We arrived at his stop and he made sure to shake my hand: "In case this is my last Sunday." Cruisin' back the other way, at Rock Island a red PT Cruiser pulled up in the next lane with a five foot ham radio antenna sprouting from the center of the roof. At the red light he was obvious as he peered over at me with his scraggly white beard and ponytail. "I used to work at BCT, wanted to see who's drivin'!" He explained with friendly sociability. "I used to be a driver, then a mechanic on road service." Apparently he loved buses enough that he bought an old one and was converting it into a motor home. 'Must get great gas mileage!' I joked about this eccentric project. "Well, if you sleep in it every night, you save a lot of money." We'd finished our first round trip and spun around for the next, when the sky opened up about halfway through. The downpours were heavy throughout Pompano all the way to A1A, where they were extremely heavy and flooding the streets. A morning that began with a serene dry calm had devolved into frenzied, blinding monsoon. East of the Intracoastal the storm sewers were maxed out, excess rainwater burbled up like mini geysers through the lift notches in the manhole covers. 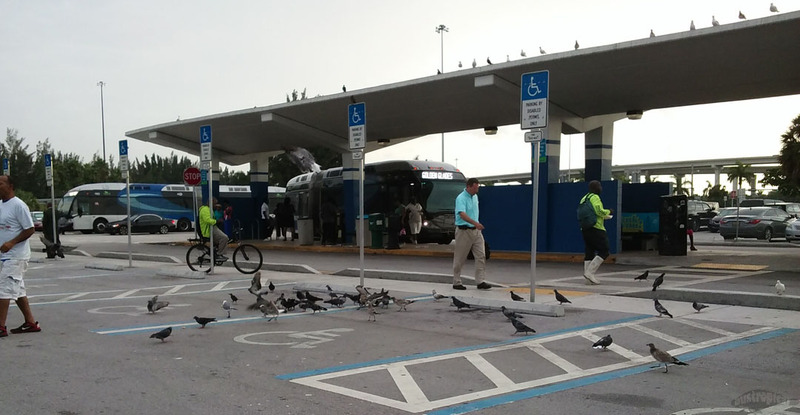 At the layover, not one person dared exit the bus and endure nature's wrath. The clouds drained themselves dry by the time our next trip was underway. A little west of US 1, at her usual stop under fat old oak trees, stood the slight Indian girl with an endearing smile and enviable cascading jet black hair that covered her entire back. An enormous umbrella shielded her from some invisible Totoro shaking raindrops off the dripping branches. It was now our final eastbound journey, and a man boarding must have misheard my greeting since he immediately began reminiscing about some streets in the Bronx ("Jerome Avenue!"). The mood took a creepy turn when he mentioned a documentary called Faces of Death. He was convinced we'd talked about the movie a couple weeks previously, but I certainly had no memory of that discussion and chalked it up as another passenger confusing me with one of my 'twin' bus driver co-workers. The Banks Road stop always gets some play on this trip, and a familiar grinning face met us as we pulled up. The type of guy who is your friend at first sight, he wore a new accessory: a bulky medical boot. With his girlfriend there to nurse him along and provide moral support, he ventured out with his injury. 'How's the foot today?' It's quicker to comment on the obvious when we don't have time for lengthy conversation. "Meh." He shrugged. "Wanna see the scar?" 'Not really. Scars freak me out.' Though a collection of them is certainly a sign of an active life. His random offer hung in the air and I took him up on it when we got to their stop. He peeled down a white sock to reveal the 5-inch wound. It came about during a drunken episode, and the humor of it outweighed any embarrassment in the telling. I wondered whether this man's malady was the end of another cruel circle, and where it began. Perhaps this event was the beginning, another instance of Life knocking our feet out from under us. And another opportunity to get off at our stop, hobble forward, and not look back. Well, maybe a glance - and a grin. Taking over an afternoon run generally means relieving another driver somewhere along the route. At that time I try to get a report on the operability of the bus along with any issues on the route (detours, lane closures, accidents). My own operability was compromised this day by a miserable bout of laryngitis, a handicap for this bus driver who likes to make Old School announcements at high volume. The relief took place near the end of the route, and the previous driver gave me a healthy bus and a report of clear streets. Ten minutes later I was at the north end layover for the 60, stretched the legs until the appointed moment arrived and we went back into service southbound. The crush of students at Broward College North Campus only set us back a few minutes, but the trip was young. Little more than 15 minutes into a one hour trip, we were in the turn lane on Atlantic at NW 27th Ave. There would be no turning for us, the road was completely barricaded. There was some extensive road work happening on the other side of the barriers, either put up in record time after the previous driver passed through or something he neglected to relay to me. It was a low blow at a crucial time of day, but bus drivers don't cry - we find a way forward. I improvised a detour to get us back on route without missing too many stops. However, the damage was done; we were late to start with and that unforeseen obstacle buried us. In the midst of our storms, the sun peeks through and reminds us why we're here. Hours into the tumult of the afternoon, when my follower was catching up with me repeatedly, a familiar face appeared. Weathered and wizened by years in the sun tending to nursery plants, her dark eyes shone from leathery wrinkles above a golden glint from smiling caps long worn through. No time for extended pleasantries, I could only smile back at my neighbor. Perhaps I shared some brief greeting in painful husky voice or perhaps merely clasped at my throat, but she stopped time for that bus and the impossible schedule became irrelevant. Settled in and settled down for the remainder of the shift, my friend at Matco Stone hopped on along that dusty stretch by the railroad. A beacon of brightness in his long-sleeve safety yellow shirt, he sympathized with the ailment limiting my speech, the words flowing quickly with his island intonation testing my accent acuity. He had something important to announce. His lady was pregnant and he was going to be a father for the first time. It was a boy. I congratulated him with as much voice as I could summon. "You have any kids?" he asked. 'Nah, kids cost money!' I joked back. "Yeah, but you gotta do something. I'm 48..."
The man who moves train cars full of rock went back to talking shop, comparing our long days. We'd worked all day and the bus was late, but the time was right.